Hey look, page 257 is here! I tell you what, I’ve been thinking about/planning/dreaming of this page for, I don’t know, over a year, and I’m thrilled that it’s here. Let’s talk about it, shall we? 1. This page serves a few narrative purposes. It makes it clear how significant the opposition to the Ultimage is, it expands the scope of the fictional reality by bringing in characters from other times and places, and it ties together some plot threads—for instance, it makes it clear how Beowulf came from ancient Scandinavia to Swann Castle. Mostly, though, this page is self-indulgent. I get that. I’m trying to put all the self-indulgence on one page and then go back to focusing on the story. 2. Planning this page took more back-and-forth communication than usual. First I had to decide which characters to include; my original list was much longer, but there’s only so much space on the page, and the Leopard Women of Venus can show up another time. I figured six panels was the most we could fit, with the Super Team taking up the bottom row and the super-heroes having a wide panel at the top. I wrote descriptions of the characters and gathered reference material, and shared that with Sam, and sent her a crude sketch of how it could be laid out. Sam moved some things around and decided on the final order, and then got to work designing characters. I wrote the captions after I knew the order they’d go in. 3. The costumed crime-fighters in the first panel are all real comic book characters from the 1940s. Specifically, they are Amazing Man, Black Terror, War Nurse, Lady Fairplay, and Bart “Daredevil” Hill. We already knew these heroes fought the Ultimage; Josh drew them on page 232. Aside from Bart Hill and Amazing Man, he chose the characters. Josh and I wrote notes about these guys in an earlier blog post. 4. The hobomancers are from a role-playing game called Hobomancer, which was created by Steve Johnson, Carter Newton, and me. The game was written by the three of us, Josh Burnett, and Colin Thomas, and published in 2012. It won the 2013 ENnie Silver Award for Best Electronic Book. I’ve worked on a lot of RPGs over the years, but Hobomancer’s the one I’m most proud of. If you’d like to read some hobomancer fiction, I highly recommend Carter’s novelSuicide’s Run: A Tale of the Hobomancers. We also published a Hobomancer Companion, written by Josh, and there’s lots of hobomancer stuff in our book American Artifacts . . . look, I warned you this was going to be self-indulgent. 5. The Laser Ponies are also from an RPG, this one called, fittingly enough, Laser Ponies. I wrote it in 2009. Abi didn’t co-create the game, because she was a baby at the time, but she did help inspire it. Because of her, I wanted to make a game that was kid-friendly. Abi has since become a Laser Ponies fan, and she created characters that will go in the second edition, if I ever get around to writing it. At some point I bought little plastic horse toys to use as miniatures for Laser Ponies conventions games, which led to Abi and me playing with the Laser Ponies, which inevitably led to them teaming up with the Super Team and visiting Swann Castle. So obviously they have to be on this page. I can totally see him traveling across time and space to battle the Ultimage. 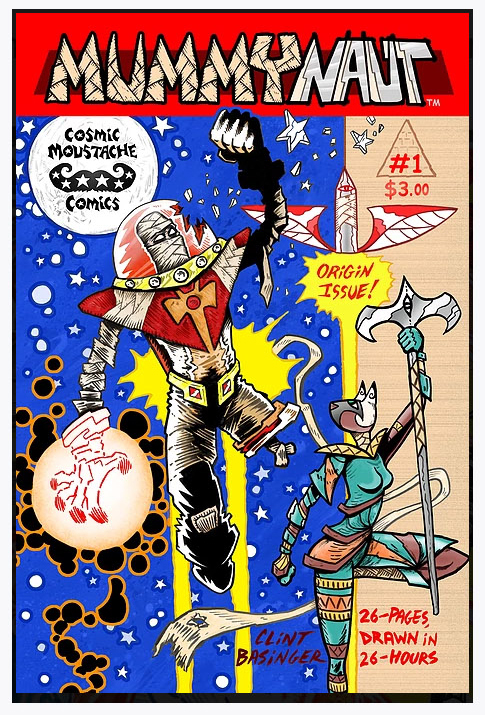 You can order copies of Mummynaut, and other fine Cosmic Mustache comics, here! 7. Speaking of other people’s characters, I’ve mentioned before that Octopus Jones was created by Joseph Morris, and Joseph was very generous in allowing us to use Octopus Jones in our Swann Castle story. 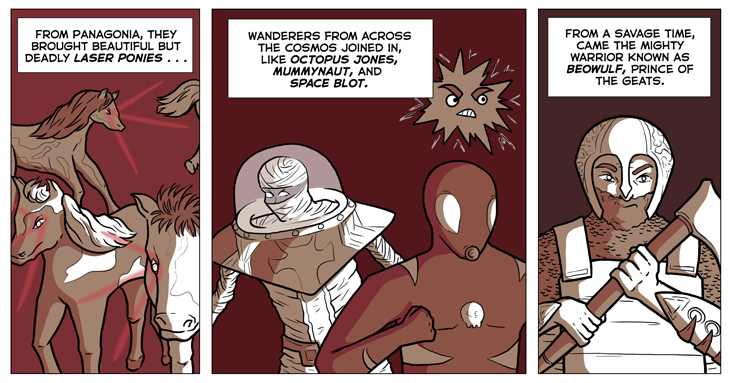 We already knew that OJ took part in the battle against the Ultimage, but it’s fun to see him in the same panel with Mummynaut and Space Blot. I really like Octopus Jones. He’s just one of Joseph’s many, many characters; you should check out Cosminomicon and 7 Worlds, and also Joseph’s Patreon. 8. Space Blot is another one of my characters, created when I was in 5th grade, revived when I was in high school, re-revived again post-college, blah blah blah. He was a supporting character in the Fuzzball & Scuzzball web comic I used to draw. I’ve always liked him, and he’s small and easy to fit into a panel, so I thought, what the heck, I’ll include him, too. I’m glad I did, because it was awesome to see Sam draw him. 9. I did not create the character of Beowulf. There was probably a person named Beowulf at some point, whose story was developed as part of an oral tradition, and then shaped into its final form by an anonymous poet. Thanks, anonymous Beowulf poet! 10. And finally, the Super Team. Here’s where it gets really self-indulgent, because the page ends on the Super Team, and they take up more space than anyone, and yet you’ve never heard of them, and it’s unclear why they’re important. They’re important because . . . a.) My sister and I made up the Super Team when we were kids, circa 1984, in my grandmother’s house, and played with them every Sunday. I have many fond memories of those days. b.) I introduced Abi to the Super Team, and she wanted to play with them, and we created many thrilling new adventures, including the one where they went to Swann Castle to fight Jason Occult. c.) One time when Abi and I were playing, the Super Team traveled to another world and met a group of characters called the Electric Team. That’s right–the Electric Team is a spin-off of the Super Team. So if the Electric Team has their own comic series, their predecessors should at least get to appear in a panel.